At times there are things which suddenly pop back into one's memory, often not having been consciously thought about for many years. Here are a few of mine from these early days of BBC Television. Much later, when the Vision Transmitter room was converted into the BBC Club room, the bar lady was so overly made-up I thought the name "Belle Starr" suited her rather well. Before the Clean Air Act of 1956 came into force, weather conditions in winter would at times produce a "smog" (ie a "smoke fog") over London in which the smoke from domestic fires and fumes from factory heating systems would be trapped on the ground. Being on a hill, AP was above the level of this smog and it was an erie experience to toil up the hill to work in this thick grey fog to come into sunshine at the top, with the Palace standing isolated as if in a grey sea. Early one morning Doris, one of the canteen staff, said to me - "There isn't any toast as we've run out of stale bread....."
There was a Public Address (PA) system in the canteen at AP and often I would hear - "This is PBX callin', - Duplicating, someone from Duplicating" (this was before the days of photocopiers). I would then look round carefully to see if perhaps three identical women would get up and walk out..... But I never did. One day down in CTR, it must have been at a weekend because the S.Tel.E (Dicky Meakin) wasn't there, I'd just made some tea, and took a cup into Dickey Meakin's office where Tony Cheale was sitting. After a while when I was collecting the empty cups and he hadn't finished his, I said, in the main room, "Has he drunk it yet?". From the office came the call - "I'm not drinking it - I'm pouring it away under the table".... Now what did he think I'd put in it? Once in 1953 when I was in C.A.R. one of the guys came in and said "I've just switched on B Racks, but all I got was smoke, so I switched them off again....." [Studio B had ceased to be used since early in 1952]. In those days the vision mixer in the Gallery was always a woman, the thinking being they had a "gentler touch". One of them was a small lady with straight dark hair, swept back. One day one of the engineers said to her "Did you park your broomstick in the car park this morning?" One of the secretaries came down to CTR (which was in the basement) to give us a script. After doing so she couldn't remember the way out. "Come with me" Jack (Kelleher) said. Unfortunately, just at that moment Brian (Davies) gave a quiet laugh. "Oh no, no" she said nervously, backing away. One day in CTR, after having done some minor prank, I said to Jack - "Don't you get fed up with me?" He replied, jokingly, "Oh you provide light relief in my onerous task....."
Jack had a habit of singing the first line of songs such as "There's an old mill by the stream" and "There's a little wooden bucket" and when one day he came up to Ron (Williams) and myself and started speaking by saying "There's - " and paused, Ron said helpfully - "a little wooden bucket?". "No no" said Jack. "An old mill by the stream?" Ron offered. "Not that either" said Jack. I can't remember if we ever did find out what it was that he was trying to say. For relaying concerts from the Royal Albert Hall in London, the BBC used Box 2 which was equipped with microphone mixers for sound balancing. 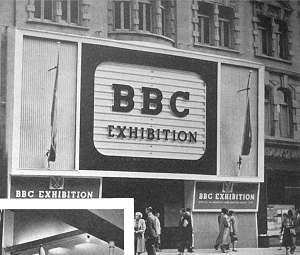 On the occasions when a concert there was not being broadcast, BBC staff could get in free and sit in the announcer's position, in the front of the Box. Living at the time in the BBC Hostel in Bayswater, it was just a short walk across the park to the RAH. It was on one such occasion that I was able to be present to hear the famous tenor Gigli sing. It was his last appearance. And since the Box was at the front of the hall, we were quite close to him. Sometimes some of us in the BBC Hostel would go to Maida Vale to be present at a broadcast concert in Studio 1. We would sit in the space available in the gallery. In those days we had to keep silent during the broadcast until the red light had gone out at the end. After listening to one broadcast with the conductor Bruno Walter, it was quite agonising having to wait for that red light to go out before we could give him the applause he deserved. On another occasion, arriving early, we had to wait in the canteen, as the composer Ralph Vaughan Williams was sitting in the gallery discussing one of his scores. Once I came out of AP at the top of the car park steps and I saw Graham from Engineering right at the other side near The Dive playing wth a new gun mic. It was pointing this way so I said quietly "I suppose you can hear every word I say". "Yes I can!" he shouted from the far side. I was impressed. Duncan Beale (his full name was T.D.Griffin-Beale) chief film editor on News, was a nice guy but rather gullible. Just outside AP at the rear was a small boating lake with an island in the middle. One lunchtime he was in a group going round the lake in a boat. They got to the island and one of them asked Duncan to get out for a moment. He did so, and quickly they rowed off and went back to work..... It was an hour or two before he was rescued by the boatman. One day in the early 1960s, it must have been late afternoon, the whole of Lime Grove lost its electricity supply, and only AP was still operational. So the news studio supplied a breakdown caption and pleasant music on studio Grams from mood music discs. Ron Gillingwater (one of the two news dubbing editors) and I were scouring the record library for suitable music. Oh this one's a good tune! So I grabbed it and a few other discs of tuneful music and raced off along the corridor and up the steep metal ladder to Studio A Gallery. Although the scheduled News transmission was at 6pm, for some reason Presentation at Lime Grove wouldn't allow us to go ahead at the proper time, even though we were the only source of tv programme. However, after much reluctance, Presentation finally relented and the News went out from AP around 6.20pm. One day we took Reg Gosling, the News Dubbing Editor, down on the grass slopes in front of AP for a bit of golf. Carefully placing the ball, he enthusiastically hit it. The ball disappeared, and in the distance there was a sharp noise and a tree branch crashed down. Another memory - this time not about television, but about Broadcasting House (BH) - All BBC centres had their own telephone Private Branch Exchanges (PBX) where a telephone operator did the connection. But in larger centres, such as BH, there was also a Private Automatic Branch Exchange (PABX) system. In the days in the 1950s when the World Service was called the General Overseas Service, its headquarters was in 200 Oxford Street, and about 10 telephone lines connected it to BH. Using the PABX system, if you dialled, say, 8 in BH, you got Oxford St, and if at 200 Oxford St you dialled, I think it was 7, you got BH. However, after dialling 8 and connecting to Oxford St, you then dialled 7, you got back to BH, then dialling 8 again you got back to Oxford St.
One last memory - in the days of disk recording, when acetate blanks were used to record radio programmes, the highly inflammable swarf removed from the disk by the cutting lathe was sucked away and deposited in a metal bucket. However, if the operator was a cigarette smoker, and absent-mindedly dropped his fag end into the bucket, there was an immediate conflagration and the bucket would become a mini 'towering inferno'..... Great days! Thinking back on how I got interested in this television business, I think I have to blame it on someone at school who had the ambitious suggestion in 1949 that we build a tv receiver. Although even before that, I had developed an interest in broadcasting. There was a kit available at the time, [by W.I. Flack, Fellow of the Royal Television Society] called the 'View Master'. 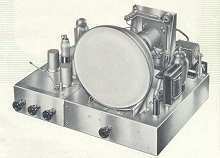 It used "ex-Government Surplus" valves (vacuum tubes) type EF50, in metal cans, with thin pins which tended to make poor contact with the bases. 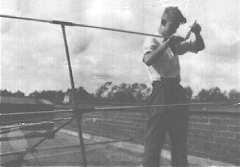 The school was near Blackpool in Lancashire, and the Holme Moss tv transmitter hadn't yet started, so we hoped to receive Sutton Coldfield in the Midlands by constructing a high-gain aerial on a tall mast. And I came across this picture of 18-year old me, working on it. (And I had a bit more hair then). The only signals we got from it were smoke ones..... However, when the Holme Moss transmitter did come into service, we got what we thought were quite good pictures on the round-faced black and white tube. One of my early pranks was making skeleton keys. I had made one for the school (which I found also opened a function hall in Cleveleys, the Pier at Fleetwood, and some other places too....). So I would go to school on a Saturday morning and watch this television set, which was in the Physics Lab. At that time I had no conscious idea, while watching the compilation of Television Newsreels, that in a year or so I would be "at the other end" showing them! It was about the time that the Holme Moss tv transmitter came on air that an exhibition devoted to Television and Radio was held in Manchester and with a friend I went along. What fascinated me was the telecine demonstration using a Cintel 35mm film scanner belonging to BREMA. It was the source of several BBC Television short films which were relayed to the tv sets around the hall. Two I remember were "Severn Westward" and "I Had a Dream Last Night". When, a few years later I mentioned this to Vernon Phipps in the Lime Grove Dubbing Theatre he said of the latter film, "Ah yes, a faint background of modulation behind high hiss level". Well, it wasn't at all as bad as that, though I did prefer the other film. One exhibit there was a radio studio and on duty that day was Daphne Oxenford with a programme of gramophone records, one of which was "Bonaventure" on a Boosey & Hawkes mood music disc which a few years later I bought for my collection. 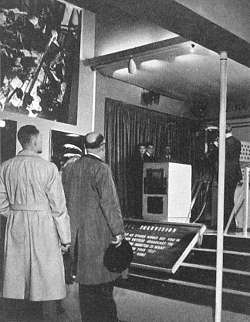 In 1951 on a trip to London to see the Festival of Britain, the BBC had an exhibition in a converted studio in Piccadilly, which included a "see yourself on the tv screen".